Weeks after Thanos (Josh Brolin) wiped out half of all life in the universe, Steve Rogers (Chris Evans), Natasha Romanoff (Scarlett Johansson), Thor (Chris Hemsworth), Bruce Banner (Mark Ruffalo), Rocket (Bradley Cooper) and the surviving Avengers struggle to deal with their losses. At the same time, Tony Stark (Robert Downey Jr.) is drifting in space with Nebula (Karen Gillan), slowly running out of food. The arrival of Carol Danvers (Brie Larson) and then Scott Lang (Paul Rudd) at the Avengers headquarters sparks a glimmer of hope in the survivors. 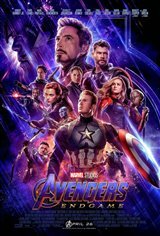 Steve rallies the remaining Avengers, including Tony and Nebula who have been rescued, and a broken Hawkeye (Jeremy Renner), who watched his wife (Linda Cardellini) and children disappear before his eyes, for one last mission when they come up with an idea that may give them a chance of undoing the damage created by Thanos.